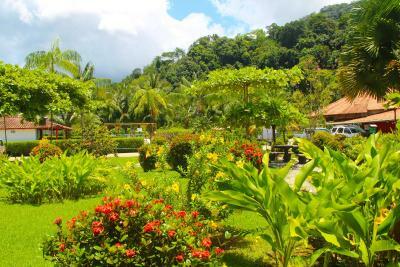 Lock in a great price for Samoa del Sur – rated 8.4 by recent guests! The rooms' air condition, the restaurant, the pool, the wifi, the staff are all excellent. It is terrific in every way. I always stay here when in Golfito and recommend them for travelers and locals. Clean, nice restaurant, view if the Gulf, swimming pool. The room, the view, the patio, the location, the pier. Our guide for a boat tour left us off at the dock right outside our room. The grounds are attractive, and the pools are lovely. The location is good and the view is amazing. You can enjoy watching the Golfito Bay. I also liked that the swimming pool isn't that close to the rooms to avoid noise. The room was beatiful. Everything was so clean and the coffee they use in the room was sooo good. 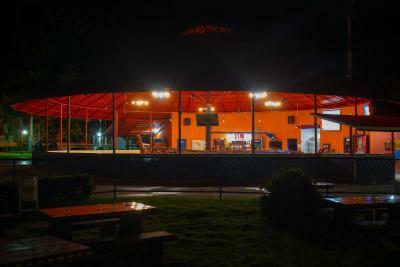 Friendly staff, clean accomodations and grounds. Breakfast was very good tico style or omlete, juice, coffee, fruit if you want. Ate dinner at their restaurant / bar all three nights there, very delicious, the swordfish Mediterranean style was superb. We got off of an 8 hour bus ride at 11:30 PM and called them to come unlock the gate...grateful for their 24 hour service! They had 2 big beds and air conditioning which was exactly what we needed! The next day we found out they were close to the ferry we wanted and they had a nice warm pool and a shaded area we could hang out in and have drinks while we waited for our ferry. The staff is very helpful and we had a good time. Breakfast included. Always when one has to leave early. Nice pool. Beautiful view from our room number 19. Sympathetic owners. Ate a snack of calmars at arrival, delicious. Even got the trick for cooking them from waiter. Then ordered a pizza at night since we wanted to watch the oscars. Deliciouuuuussss pizza. The staff and owner ,Claud, were very friendly. Room was clean, shower lacked water pressure and long wait for hot water. Had to put suitcase on the floor. Awesome view except for fuel station (for boats) , construction materials and a large abandoned boat. 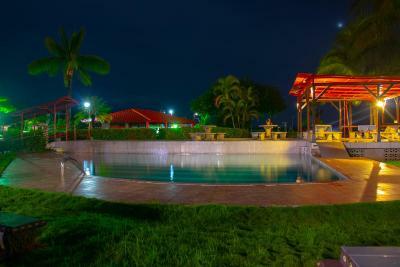 Nice pool and numerous outdoor places to relax around tables. Also, very competent maids and excellent air conditioners. Samoa del Sur This rating is a reflection of how the property compares to the industry standard when it comes to price, facilities and services available. It's based on a self-evaluation by the property. Use this rating to help choose your stay! 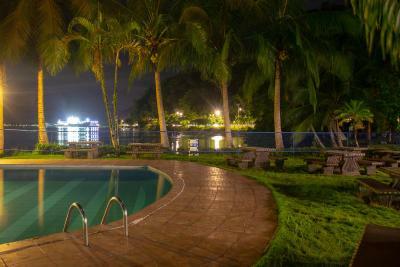 Featuring an outdoor swimming pool, Samoa del Sur is located in Golfito. Among the various facilities are a garden, a terrace, as well as a bar. Free WiFi is at guests' disposal. At the hotel, the rooms are equipped with a desk, a flat-screen TV and a private bathroom. Samoa del Sur provides certain accommodations with sea views, and rooms contain a patio. The rooms at the accommodation feature air conditioning and a closet. 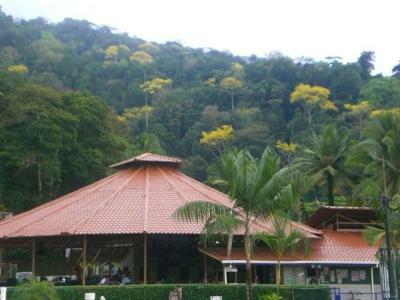 Samoa del Sur offers a continental or buffet breakfast. You can play ping pong at the hotel, and car rental is available. Golfito Airport is 2.6 miles away. 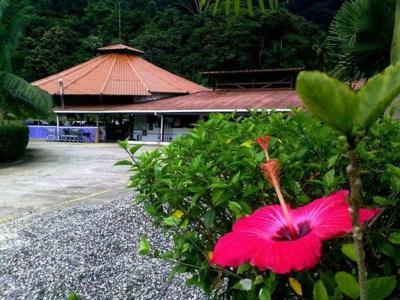 When would you like to stay at Samoa del Sur? 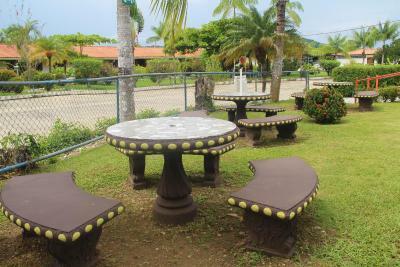 House Rules Samoa del Sur takes special requests – add in the next step! Samoa del Sur accepts these cards and reserves the right to temporarily hold an amount prior to arrival. Room 19 was terrible, very little, the faucet in the lavatory couldn't be use as it was so small and close to the ceramic bowl. The shower was also terrible, we had to shower in room 4. One of the glass doors of the balcony didn't lock. Room 4 was as expected, good size and confortable. Last time the internet did not work. Staff and owners are very polite here, I feel always welcome. The room was big and had sliding doors that let lots of fresh air in during the night. We had a deck overlooking the bay The restaurant was great. The fish was delicious and everyone was so friendly. Absolutely no Wi-Fi signal in room 19 despite it being advertised. To use the Wi-Fi, it was necessary to go outside of the room (outside temperature 35°C).Staff obviously was aware of this and guided me to the desinterested manager who did not care at all and just ignored me after me asking if was possible to fix that issue. Sea views, room was spaceous and clean although the entire complex looked a little run down. It would have been nice to have hot water for the shower. The management thought they had it fixed, but, alas, it was not. They were very nice about it, and clearly dismayed that it was not fixed. We were very hot and sweaty both nights, and missed a warm shower, but I am quite certain that the management is bending over backward to get it fixed for the next guest. Breakfast could be improved to offer more options. Bathroom hot water did not work. Stains on the wall. The room stank of disinfectant, the beds were uncomfortable, and the bedspread smelled worse than the room. We have stayed in comparably priced places in Panama that were much better and didn't aggravate my sinuses. Hoped there was a safe in the room. But the staff reassured me all was safe. They were correct. I was able to travel around safely with my passport left in my room. Excellent security and friendly staff. They were great. Loved the fact I can catch the boat tours so close by. They came and picked me up at the Samoa del Sur pier.